If you are living in Belgium and you have internet from Belgacom, Scarlet or EDPNET, you might be the (un)happy user of their VDSL2 modem called BBox-2, which is actually a Sagem F@st 3464 in a different case. It is using a PPPoE connection to get the dynamic WAN IP. Belgacom is usually updating the IP once every 3 days. 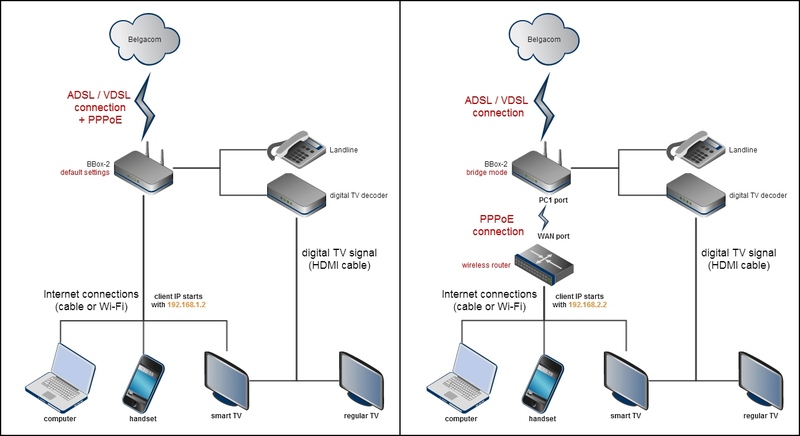 If you have your own router, or you are planning to buy one and you need features like Dynamic DNS, port forwarding, VPN server, FTP or other types of home-hosted servers, you need to bypass the modem’s wan connection by putting it in bridge mode and make the PPPoE connection directly on your router. In this post I will refer to BBox-2 as “the modem” and your own router as “the router”. Keep your PPPoE internet connection credentials close. (ex: un1234@BELGACOM). Change the WAN connection type from Static IP to PPPoE and write the username and password provided by your internet provider. The router will connect to internet and will get the IP provided by your ISP. You are now able to set-up dynamic DNS directly on your router (BBox-2 modem works only with DynDNS which is not free any more) and forward ports to your self-hosted services. Other services like Belgacom TV and I-Talk should continue to work.